Power Supplies There are 4 products. 14VDC Power Supply with Coax Injector. PAL Type connector. Commonly called a TV booster, although this is technically incorrect. The power supply sends voltage up to the TV Booster/Masthead amplifier on the roof. Thus the name and conception a TV booster. The voltage powers up the masthead amplifier therefore boosting/amplifying your signal. 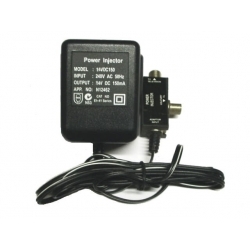 17VAC Power Supply with Coax Injector. PAL Type connector. Commonly called a TV booster, although this is technically incorrect. The power supply sends voltage up to the TV Booster/Masthead amplifier on the roof. Thus the name and conception a TV booster. The voltage powers up the masthead amplifier therefore boosting/amplifying your signal.